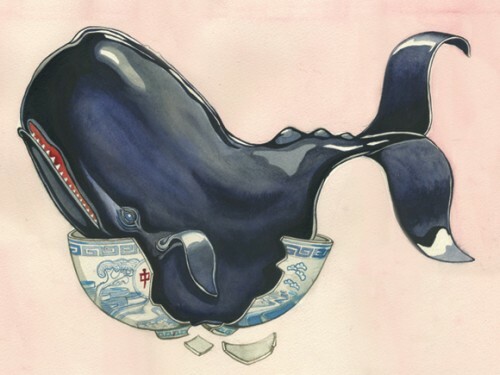 A short story called Raising Whales by Xiang Zuotie. Excerpt clipped from a post on Prospect Magazine. At dusk one evening, as cooking smoke started rising from the roofs of the houses, the head of our village came back from market with baby whales for everybody. We were going to develop the local whale-farming industry, he said. The best part about raising whales was that once they grew up, we’d be able to cut off their heads and steam them with diced red peppers. The baby whales came in a clear glass bottle. They had glossy black skin and were about the size of a person’s ring-finger, and they swam back and forth in the bottle like tadpoles. We split the baby whales up amongst ourselves and took them home to raise. The baby whales grew quickly, but that was where the trouble started. In my case, for instance, I had originally put my baby whale in a little eye-drop bottle, which I hung in the middle of the house so the rats wouldn’t kill it. I woke the next day to find that it had grown to completely fill the bottle and trying miserably to move around. I cracked the bottle open as fast as I could and placed the baby whale in a bowl. In the days that followed, I found myself taking out every container in the house: rice bowls, fruit bowls, soup pots, washbasins, foot baths… Looking for containers led to an extra discovery: I realized each of the utterly random, disorganized needs of the human body had its own spatial boundaries as well as systematic correspondence with a whole set of common vessels.